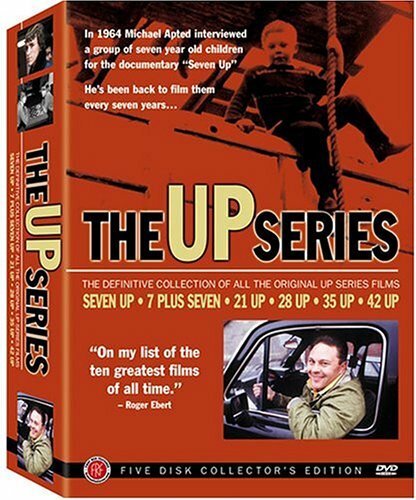 Does anyone know why The Seven-Ups isn't available on DVD? Even if you want to quibble about the quality of the film, you have to admit that it includes one of the best car chases ever made. Fox just hasn't gotten to it yet. There's an entire century of movies out there. Gonna take awhile to get to them all. Every once in awhile this one shows up on one of the Encore channels; until it's available on DVD it's worth keeping an eye open for their next showing. Yeah, I know there are a lot of movies in Fox's catalog but there seems to be no rhyme nor reason for the selections for re-releases. I've rented this on VHS but it's definitely not the same quality as DVD. I thought you were talking about Seven Up!. A new one is due to be filmed this year, BTW. Great flick -- Roy Scheider in pre-Jaws mode. I thought so, too! Actually, 49 Up has already aired in Britain. Hopefully we'll get it early next year. This is one of those series I saw in the video store when I was younger and then sort of forgot about. The box set is now on my DDD wishlist, awaiting the next 20% off sale in June. If the price stays the same, I think it turns out to be in the $60 range. That's a great price. I've been watching them every seven years since 21 Up (I've also seen the first two). They are possibly my favorite documentaries, yet weirdly, I don't want to own them. I kind of like rediscovering the series every seven years after almost forgetting about it. I would like to see the special features though. Maybe I'll Netflix 'em after I see 49 Up next year. Last edited by Plazmatix; 12-30-05 at 11:24 PM. Good movie. I've got the laser disc, unfortunately its about as crappy looking as the tape version. Are there any extras at all on the laser disc? & I don't know New York very well, but to me it looks like the whole thing was filmed in New York..thanks for the info! I have the CBS / Fox release of The Seven Ups on LD. Framed at 1.33:1 and looking pretty noisy, it is nothing to write home about, but I still watch the film every now and again. The car chase remains one of my favorites and I really enjoyed Scheider's performance in this film. Most of the supporting cast has a decidedly non-Hollywood appearence which adds a lot of authenticity to the film. The film, for me, really captures the gritty 70's film experience and works very well because of that aspect. I do not know if there were any other LD releases, but the CLV version has no extras. Re: shot in New York. From the back cover of the LD; "Shot entirely on location in New York over a 12 week period,..."
I'd love to see Fox give this a nice DVD release that improves upon the LD presentation. Well, I sent in an email to Fox asking about information on the release of this one on DVD. We'll see if they respond. View Next Unread Fear and Loathing in Las GameStop?